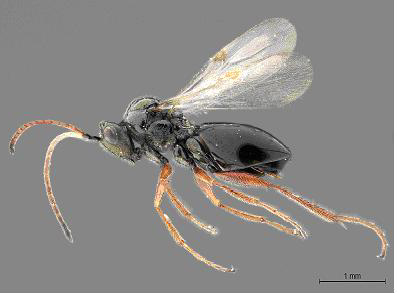 A newly published open-access article "Afrotropical Cynipoidea (Hymenoptera)" by Dr. Simon van Noort, from the Natural History Department, Iziko South African Museum, Dr. Matthew L. Buffington from the Systematic Entomology Lab, USDA, and Dr Mattias Forshage from the Swedish Museum of Natural History provides cutting edge resources to enable the identification of parasitoid wasps in Africa and Madagascar. The paper also provides an overview of biological associations. The development of this resource is aimed to facilitate future research on this ecologically and agriculturally important superfamily of wasps. This wasp group is represented by 306 described species and 54 genera in the region, but there are hundreds of further species to be described. Seven of these genera are only known from undescribed species in the region. The rationale behind this initiative is to produce user-friendly, accessible keys to these wasps based on current taxonomic knowledge, a contemporary state-of-the-art resource that will be available to facilitate future work on the taxonomy of these wasps. With continued exploration of the region new species discoveries are being made all the time and an identification resource such as this will facilitate the process of discovery and documentation of the region's biodiversity. The study was published in the open access journal ZooKeys. This initial contribution to the book on the wasps, bees and ants of Africa and Madagascar marks a turning point in the larger understanding and appreciation of this incredibly diverse and important order of insects. There are 20 000 described species and 2 000 genera of wasps, bees and ants in the region, but there are hundreds of thousands of species still waiting to be discovered and described. The final book will provide an essential resource for identification of African and Madagascan wasps, bees and ants by a diverse array of end-users, from specialists, ecologists, and conservationists, to the applied forestry and agricultural sectors, enabling effective long-term conservation of an economically important and ecologically significant component of African and Madagascan ecosystems. What's on the menu for young African sawflies?